13305. Darrell Wayne CLOPTON 1 (Joseph D CLOPTON , Mildred Elizabeth LAMOUREUX , Minnie E STARR , Clara Jane BITLER , Daniel , Daniel , John , Johannes ) was born on 26 Apr 1957 in Emporia, Lyon Co, KS. He died on 2 Jun 2009 in Stormont-Vail Hospital, Topeka, Shawnee Co, KS. He was buried on 6 Jun 2009 in Cottonwood Cemetery, Emporia, Lyon Co, KS. Darrell was issued a social security number in 1969 in KS. He served in the military with U.S. Army. He worked as truck driver with Floyd Wild Trucking and Bunge Corporation. He worked as maintenance man with Alterra Sterling House. He was a member of Victory Fellowship Four Square Gospel Church. He was a member of Drum and Bugle Corps in Emporia, KS. He resided in Jun 2009 in 517 Wilson St, Emporia, KS. Darrell married Jacque LOGAN in 1982. Jacob Dale CLOPTON was born on 23 Aug 1983. He died on 24 Aug 1983. He was buried in Sacred Heart Cemetery, Emporia, Lyon Co, KS. 18572 M ii Julian Drew CLOPTON. 18573 F iii Kellie CLOPTON. 18574 F iv Dara Ann CLOPTON. 18575 M v Joseph Dane CLOPTON. Darrell also married Lisa D ARCHER on 2 Jan 2002 in Miami, Ottawa Co, OK.
13306. Daniel D CLOPTON (Joseph D CLOPTON , Mildred Elizabeth LAMOUREUX , Minnie E STARR , Clara Jane BITLER , Daniel , Daniel , John , Johannes ). 18576 M i Dillon CLOPTON. 18577 F ii Brittany CLOPTON. 18578 M iii Brandon CLOPTON. 18579 F iv Breahna Irene CLOPTON. 18580 F v Tiffany CLOPTON. 13307. Kathy Anne CLOPTON (Joseph D CLOPTON , Mildred Elizabeth LAMOUREUX , Minnie E STARR , Clara Jane BITLER , Daniel , Daniel , John , Johannes ). 18581 M i Joshua David DONIGAN. 18582 M ii Ryan M DONIGAN. 18583 M iii William DONIGAN Jr.
18584 F iv Erin R DONIGAN. 13311. 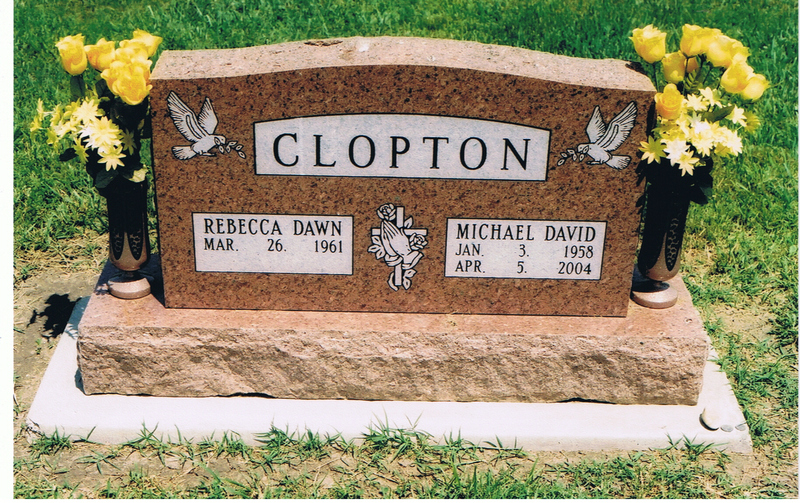 Michael David "David" CLOPTON [scrapbook] 1, 2, 3, 4 (Delbert Dean CLOPTON , Mildred Elizabeth LAMOUREUX , Minnie E STARR , Clara Jane BITLER , Daniel , Daniel , John , Johannes ) was born on 3 Jan 1958 in Wichita, Sedgwick Co, KS. He died on 5 Apr 2004 in Newman Regional Health, Emporia, Lyon Co, KS. He was buried in Maplewood Memorial Lawn Cemetery, Emporia, Lyon Co, KS. David was issued a social security number in 1971 in KS. He worked as estimator with Sauder Custom Fabrications. He resided in Apr 2004 in Emporia, Lyon Co, KS. David married Rebecca Dawn DAVIS "Becky" on 25 Jun 1983 in Messiah Lutheran Church, Emporia, Lyon Co, KS. 18585 F i Rachel CLOPTON. 18586 F ii Megan CLOPTON. 13315. Stephen REAY (Herbert Wilson REAY , Mary Elizabeth HEIDRICK , Charles Lester HEIDRICK , Cora Bell BITLER , Daniel , Daniel , John , Johannes ). 18587 F i Megan REAY. 18588 M ii Sean REAY. 13317. Celine REAY (Herbert Wilson REAY , Mary Elizabeth HEIDRICK , Charles Lester HEIDRICK , Cora Bell BITLER , Daniel , Daniel , John , Johannes ). Celine married Tony SANTA CRUZ. 18589 M i Raymond SANTA CRUZ. 13322. David WALLER (Sandra Kay THORNTON , Corinne Elizabeth SHUNK , Elizabeth HEIDRICK , Cora Bell BITLER , Daniel , Daniel , John , Johannes ). + 18590 M i Cody WALLER. 13323. Lance THORNTON (Larry Stanley THORNTON , Corinne Elizabeth SHUNK , Elizabeth HEIDRICK , Cora Bell BITLER , Daniel , Daniel , John , Johannes ). Lance married Kimberley PORTNER "Kim". 18591 F i Emily K THORNTON. 13333. Thomas Victor HEIDRICK 1 (Thomas E HEIDRICK , Victor Gale HEIDRICK , George Washington HEIDRICK , Cora Bell BITLER , Daniel , Daniel , John , Johannes ) was born on 28 Feb 1972 in Long Beach, Los Angeles Co, CA. He died on 14 Nov 2006 in Neosho Memorial Regional Medical Center, Chanute, Neosho Co, KS. He was buried in Creamated. Thomas graduated from Lompoc High School in 1990 in Lompoc, Santa Barbara Co, CA. He worked as Ross Stored (Corporate Offices) in Newark, Alameda Co, CA. He resided in Nov 2006 in Humboldt, Allen Co, KS. Thomas married Diana Dawn MORRIS on 22 Feb 1993 in Las Vegas, Clark Co, NV. 18592 M i Ryan Thomas HEIDRICK. 18593 M ii Tylar David HEIDRICK. 18594 M iii Brandin R HEIDRICK. 18595 F iv Brittney D HEIDRICK. 13347. Vera Dyann "Annie" BRICE 1, 2 (Raymond Clarence BRICE , Margaret Ruth BRAUCHER , Lillie May HINES , Maggie Moss BITLER , Daniel , Daniel , John , Johannes ) was born on 14 Dec 1971 in El Dorado, Butler Co, KS. She died on 18 Apr 2007 in Near Protection, Comanche Co, KS. She was buried on 23 Apr 2007 in Crown Hill Cemetery, Coldwater, Comanche Co, KS. Annie graduated from El Dorado High School. She resided in El Dorado, Butler Co, KS. She graduated with BS Social Rehabilitation Services from Emporia State University in 1995. She resided in 2002 in Coldwater, Comanche Co, KS. She worked as office manager with Buy the Byte Computer Sales and Service in Coldwater, KS. The cause of her death was injuries sustained in an automibile accident. She was a member of United Methodist Church in Coldwater, KS. She was a member of Mothers of Twins Club. Annie married Anthony SMITH "Tony" on 26 Jul 1997 in Augusta, Butler, KS. 18596 M i Garrett SMITH. 18597 F ii Brooke SMITH. 13350. Brien James BRICE (James Ronald BRICE , Margaret Ruth BRAUCHER , Lillie May HINES , Maggie Moss BITLER , Daniel , Daniel , John , Johannes ). Brien married Michelle Beth DILLENKOFER. 18598 M i [Male] BRICE. 18599 M ii [Male] BRICE. 18600 M iii [Male] BRICE. 13352. Heather E BRICE (Glenn Eldon BRICE , Margaret Ruth BRAUCHER , Lillie May HINES , Maggie Moss BITLER , Daniel , Daniel , John , Johannes ). Heather married Thomas A KARNOSKI "Tom". 18601 F i Adrienne "A. J." KARNOSKI.